Produced by Marc Mac Marking the 10th anniversary of this series of 'mixtape style', revolutionary and thought provoking albums, Omniverse Records have pressed a short run of never before on Vinyl releases. 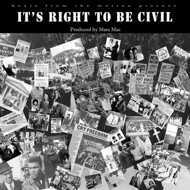 The complete set of records "It's Right To Be Civil", "Extend The Knowledge", "Message From Soulville" and the new "Generation - X" albums will be available each on single record continuous play vinyl. The albums are a must for the fans of Marc Mac's side projects, each album has a story to tell and the collection makes great listening both musically and subtly informative. This is without doubt for the collectors. Not to be slept on.